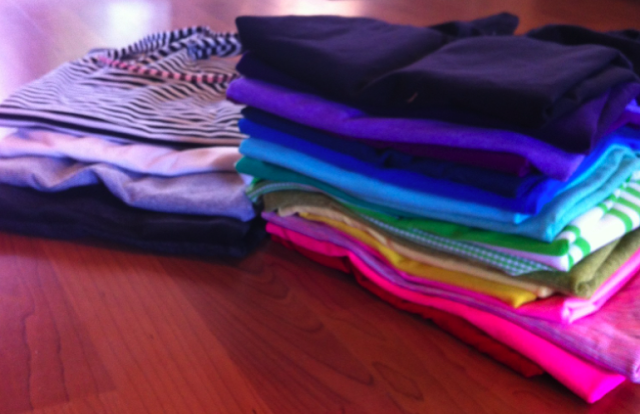 Following in Lululemon blogger trend today along with Lululemon Addict, I bring you my Lululemon Cool Racerback Collection. It’s not huge by any means but I like to have a good variety of different colors rather than sticking to one or two colors in several shades, and I’ve found over the years that my preference is solid colors rather than heathered or static (I’ve sold all those off for the most part). This collection has changed and evolved so much over the past three years because I’m constantly weeding and culling, but I’m happiest with this group now and they are the hardest workers in my closet. I pretty much only wear CRB’s to crossfit but occasionally mess with other tanks, so these suckers get about 5 days a week of sweaty rotation, plus casual wear. My colors from bottom to top: Currant, Raspberry Glow, April Wee Are From Space, Pink Shell, Mac N Cheese, Mellow Lemon, Split Pea Wee Stripe, Frond Gingham, Frond Ocean Stripe, Savage Green, Heathered Menthol, Heathered Angel Blue, Beaming Blue, Pigment Blue, Limitless Blue, Tender Violet, Heathered Power Purple, Solid Lolo, Black Swan. The Neutrals: Black Macro Micro Stripe, Coal and Ghost Wee Stripe, Jackquard Mesh White, Classic Black White Stripe. *bold type means these are my most favorite, most used. "The Latest: Heat It Up Bra, Heat It Up Crops, Surya Tank, Bleached Coral Rejuvenate Hoodie and More"